While the weather connection to Gordon is breaking down, scattered showers and thunderstorms remain in play. There may be a few less around this weekend. Today and Tonight: Friday will bring another round of scattered showers and thunderstorms—especially during the afternoon hours. Downpours and frequent lightning remain possible. Highs will make it to the upper 80s followed by lows in the low 70s. Up Next: Saturday, there should be a slight tick down in rain coverage with only isolated afternoon showers. Therefore, highs will go a little warmer into the low 90s. Do not count on staying dry, but radar should not be as busy as Thursday and Friday. A front will stall northwest of the local area Sunday into early next week. 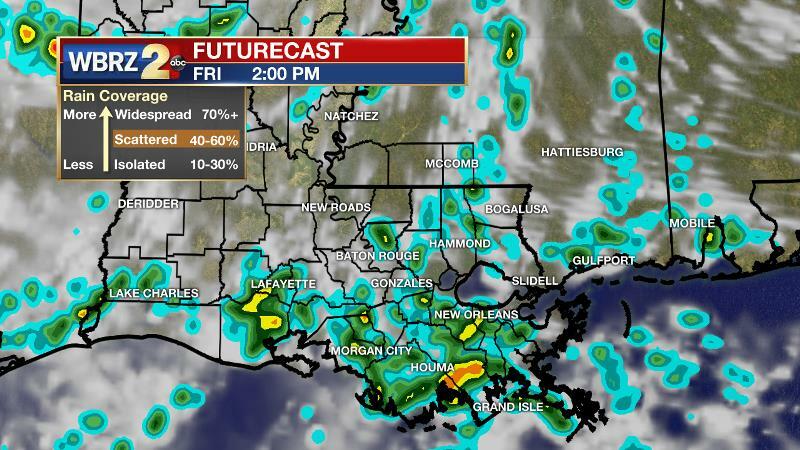 So unfortunately we will not getting any humidity relief and there will be another surge of showers and thunderstorms. Higher rain coverage is expected through at least Wednesday. Football Forecasts: Friday night high school games should find showers and thunderstorms diminishing in coverage around kickoff. One or two games could meet a delay if there are any remnant lightning strikes around. 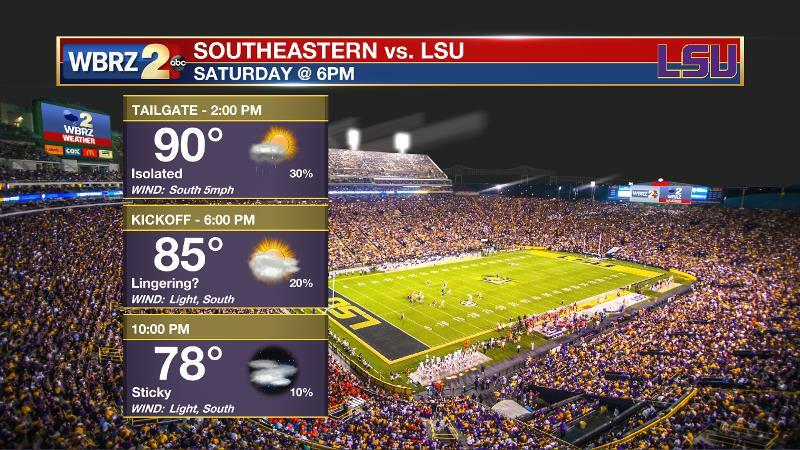 For LSU’s opening Saturday at home, tailgaters and game-goers should find a mostly dry and warm day. However, the warm season pattern is still alive and isolated showers and storms are expected to pop during the second half of the day. These types of cells are unpredictable until they develop so keep an eye to the WBRZ WX App. and we will all hope they miss campus. 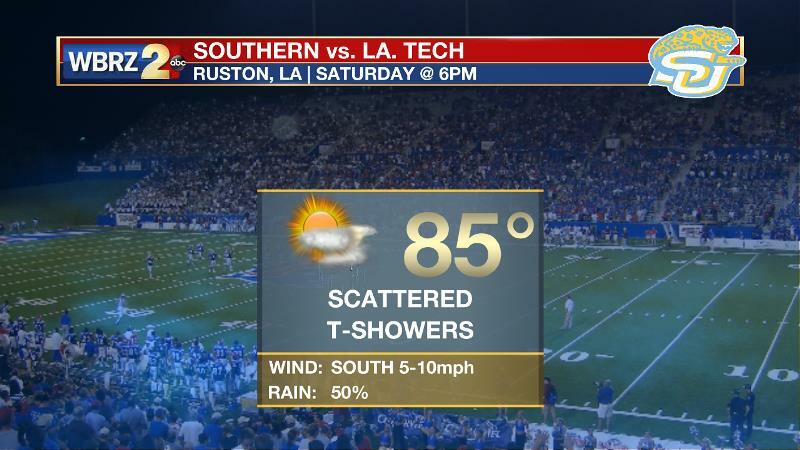 Southern will travel to Ruston where there is a better chance of showers and thunderstorms up to game time and perhaps lingering throughout. That will be in part to leftover moisture from Gordon. The Tropics: The Atlantic Basin is rather busy as we near the climatological peak of hurricane season (Sept. 10). Florence has weakened into a tropical storm within a very harsh environment. However, the system will survive and likely gather strength once again as it moves over warmer water. Forecast model guidance agrees that Florence will become a major hurricane again. There is disagreement as to track with a large spread of possibilities from a curve out to sea to an East Coast landfall. North Florida to New England need to continue to monitor this system. Two other tropical waves in the far eastern Atlantic are very likely to become Helene and Isaac. While it is far too early to tell if these systems will threaten the U.S., forecast models indicate a little more attention should be paid to Invest 92L which is pegged to take a more southern track toward the Leeward Islands. A weak trough in the atmosphere tied to the remnants of Gordon will leave instability across the region through Saturday. With this feature present, daytime heating and marine breeze interactions should be plenty to activate showers and thunderstorms for inland areas late morning into the afternoon. It appears that moisture could turn down a notch for Saturday leading to isolated rather than scattered showers and thunderstorms, but by no means does it look like a completely dry day. A longwave trough will dig into the Mid-South by Sunday and the axis of this trough will setup just west of the local area. Both global forecast models agree that the trough will remain stagnant through at least Tuesday. An associated cold front will also be draped from the Ohio Valley to east Texas with very little eastward progression on its southern end. Convective complexes from the front and areas of positive vorticity advection on the lee side of the trough will pass over the local area and trigger rounds of showers and thunderstorms. This pattern is likely to persist well into and perhaps through next week.